If you’ve perused any of the street style from the various fashion weeks, you would have seen the wear-a-jacket-as-a-cape look. It’s a very retro-chic, don’t you think? I’ve been dying to wear this Vanessa Bruno coat since I bought it on sale at My-Wardrobe last season, and it’s finally cool enough! 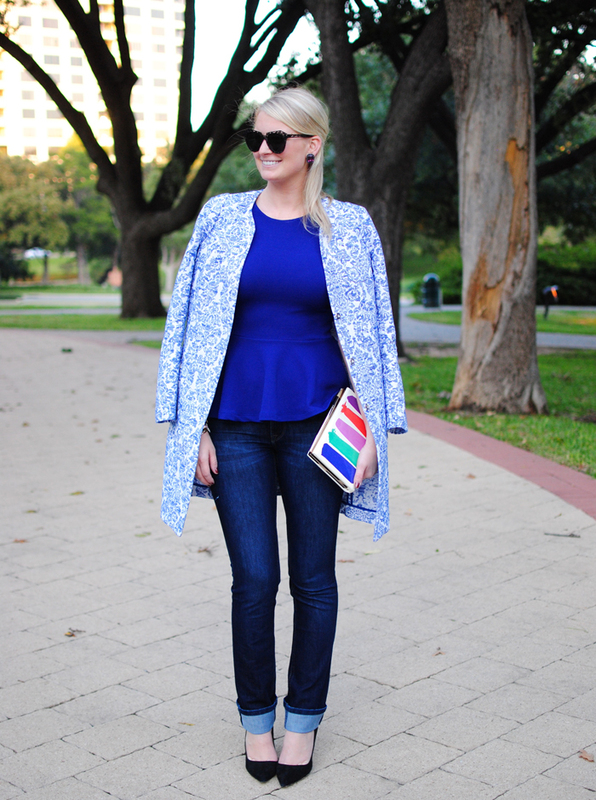 The coat is very light, so it’s totally appropriate for the slight chill in the evenings in Dallas and serves as an excellent transition piece for both fall and spring. PS: How much do you love this Kate Spade brushtroke clutch? The clasp is a paint brush! Genius. this blue pallet is beautiful on you. your blonde hair & pale skin are the perfectly paired! plus your clutch & big stud earrings are added bonuses!! 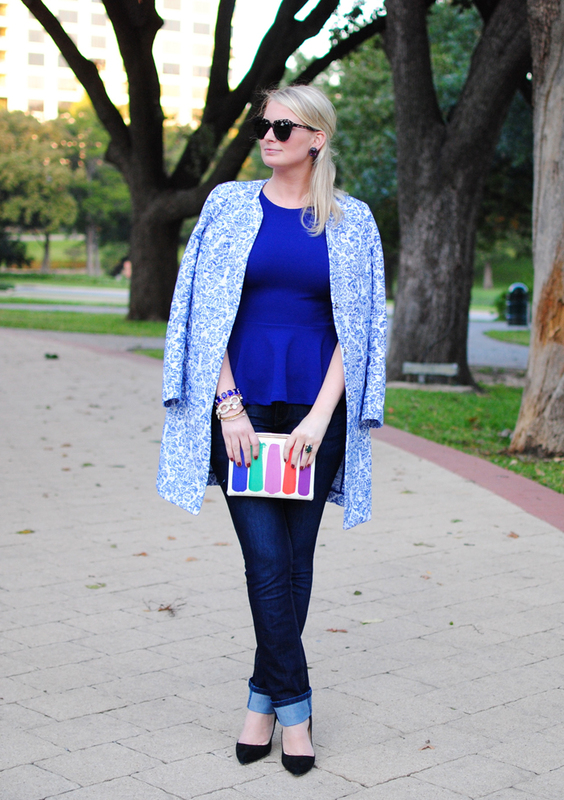 This blue looks stunning on you and the print of the jacket is simply beyond words. So in love with this outfit-one of my favorite of yours. 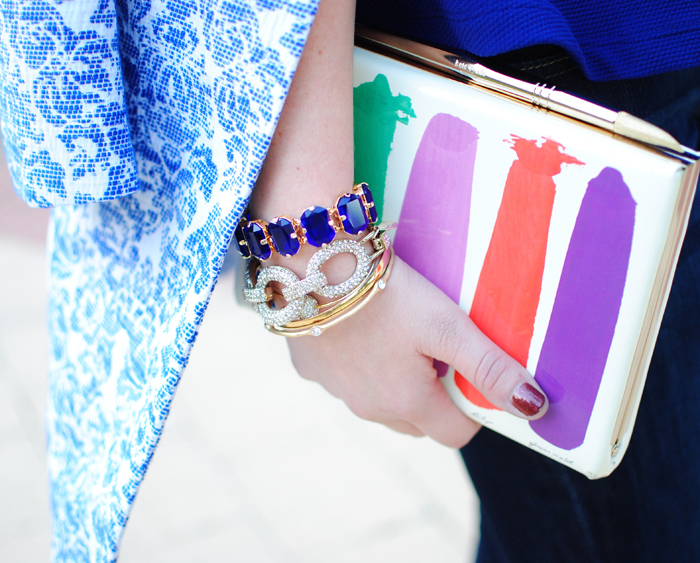 Also, been crushing on that clutch ever since I saw it. Love it paired with an all blue ensemble-really makes it stand out.